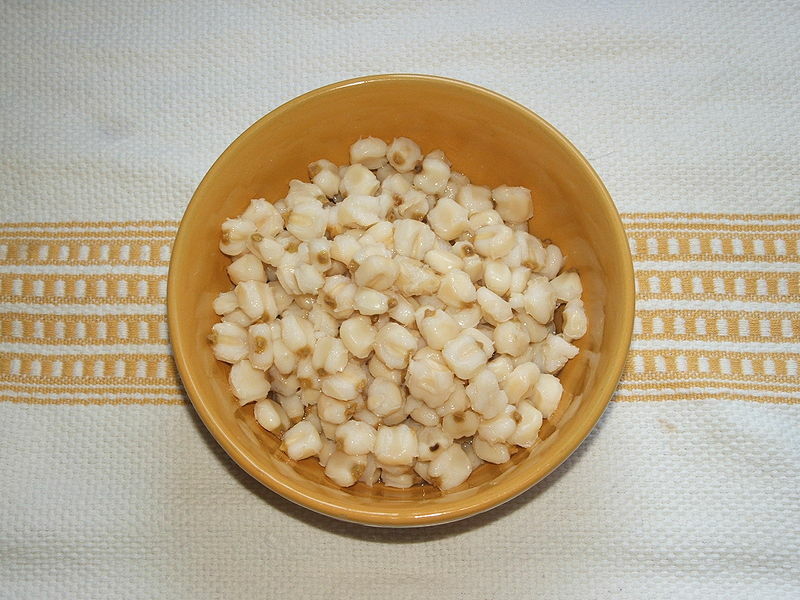 Hominy or nixtamal is dried maize kernels which have been treated with an alkali. The traditional United States version involves soaking dried corn in lye-water (sodium hydroxide or potassium hydroxide solution), traditionally derived from wood ash, until the hulls are removed. Mexican recipes describe a preparation process consisting primarily of cooking in lime-water (calcium hydroxide). In either case, the process is called nixtamalization, and removes the germ and the hard outer hull from the kernels, making them more palatable, easier to digest, and easier to process. Commercially available canned hominy may have a slightly stronger scent when compared to the traditional preparation. Although prepared hominy may be purchased, some people prefer to prepare it themselves. Hominy serves as a foundation from which many satisfactory dishes can be made, as it is high in food value and reasonable in cost. The earliest known usage of nixtamalization was in what is present-day Guatemala around 1500–1200 BC. It affords several significant nutritional advantages over untreated maize products. It converts some of the niacin (and possibly other B vitamins) into a form more absorbable by the body, improves the availability of the amino acids, and (at least in the lime-treated variant) supplements the calcium content, balancing maize's comparative excess of phosphorus. Many Native American cultures made hominy and integrated it into their diet. Cherokees, for example, made hominy grits by soaking corn in a weak lye solution obtained by leaching hardwood ash with water and beating it with a kanona (corn beater). The grits were used to make a traditional hominy soup, cornbread, dumplings or fried with bacon and green onions. The following recipe for making hominy should provide 3 quarts of this cereal; however, as is true of other recipes, the quantities given may be increased or decreased to meet with the requirements of the household. Put the water into a large kettle or saucepan, and into the water put the lye. Allow the water to come to the boiling point, and then add the corn and let it boil until the skins will slip off the grains when they are pressed between the thumb and the finger. Take from the stove, stir sufficiently to loosen the skins, and then remove them by washing the grains of corn in a coarse colander. Cover the grains with cold water and return to the fire. When the water boils, pour it off. Repeat this process at least three times, so as to make sure that there is no trace of the lye, and then allow the grains to cook in more water until they burst. Season them with the salt, and while the hominy thus prepared is still hot put it into a jar or a crock and cover it tight until it is to be used. The water in which the hominy is cooked should remain on it. Warning: Lye is caustic and must be handled with care! Lye may cause serious burns. If you decide to use lye, add it gradually to the bulk of the water while stirring to dissipate the heat of solution. Some recipes using hominy include menudo (a spicy tripe and hominy soup), pozole (a stew of hominy and pork, chicken, or other meat), hominy bread, hominy chili, hog n' hominy, casseroles and fried dishes. Hominy can be ground coarsely to make hominy grits, or into a fine mash (dough) to make masa, the dough used to make tamales.